Daughter Sarah and I spent the weekend before Thanksgiving visiting first Savannah and then Charleston. We had a grand time and thoroughly enjoyed each city although we did find them different. In Charleston, we signed up for the Charleston Tea Party Walking Tour and with our guide, Marianne, headed to see "up close and personal" some of the historic buildings and gardens of "Old Charleston". A garden courtyard with ivy growing up the brick walls and a millstone as a focal point in the garden. For us prairie girls, palm trees seemed out of place! 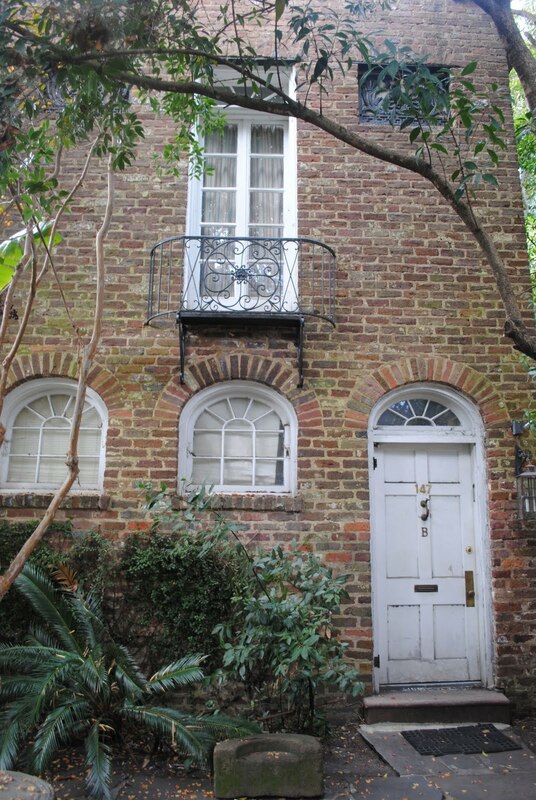 A lovely house -- the front door of which opens into the courtyard. I could live here and it's right across the street from the church! 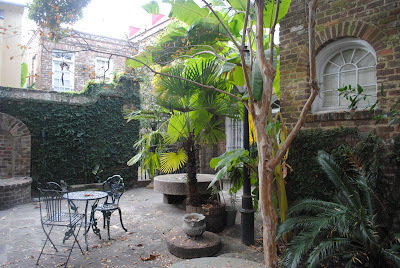 A front courtyard and home. So many of them are only one room wide -- but they do go back and back! 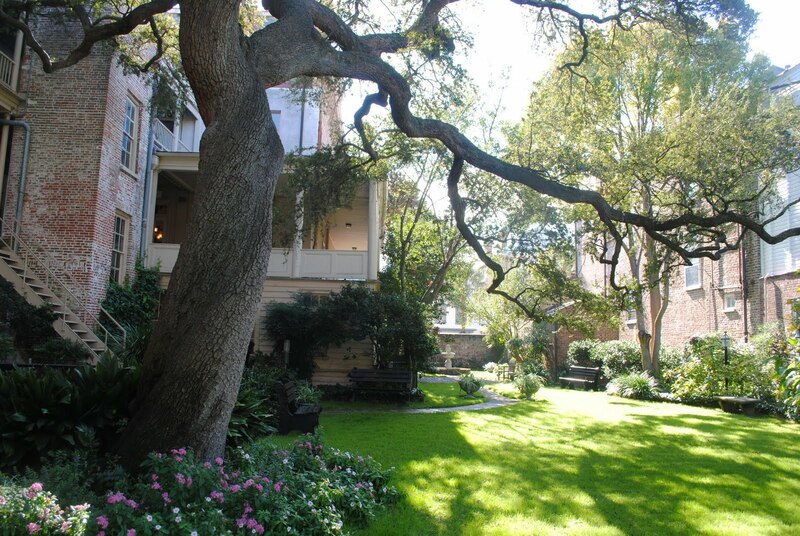 A lovely Charleston garden -- one of the few big gardens left -- so many have been used to build additional houses upon! 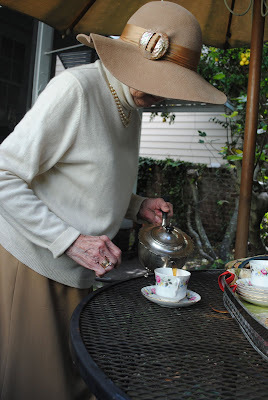 After the tour we got to go to our guide's home in the Charleston Historic District for a cup of tea in her garden which, as she described it was "wild and weedy"! And, indeed, it was and like so many gardens it was a "pocket" garden making Linderhof's small garden look like an estate! 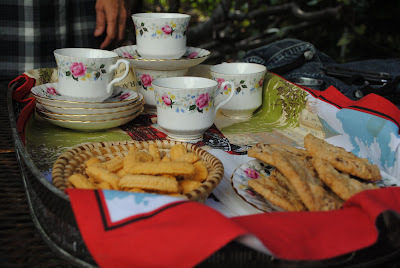 Mariane was English and she provided both tea and a nosh after our tour. A much needed respite after two hours of hiking around historic Charleston. The cups and tray were her grandmother's which she brought over from England. From the original 12, she has 6 left. And she provided both a sweet and a savory -- traditional Southern cheese straws and a "biscuit" with pecans and coconut. I did pry the recipe out of her -- but it is a sketchy one and I do hope I can reproduce them for they were, indeed, yummy! 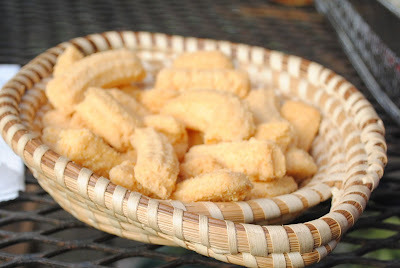 And only in Charleston would you find the cheese straws in a sweet grass basket! Our hostess and tour guide, Marianne pouring out of her grandmother's tea pot. Marianne was born in England and has maintained her British citizenship even though she's lived in Charleston almost 50 years. This is lovely ! Marianne is so sweet, I loved the pics , the last one is a really lovely portrait! So glad you got a taste of my section of the woods. Savannah and Charleston are magical. How great to see a fellow Englishwoman serving tea in one of my favourite US cities, Charleston. Will you be writing about Savannah soon? We spent time there last month and I truly love that town! Enjoyed your post so much. We visited the two cities last fall, although there was NOT enough time in either. I want to go back. Did you visit the tea plantation outside Charleston? It was one of my very favorite places to see. The our neck of the woods has had such a lovely autumn, but it is frosty out this morning! Enjoy the chill today. Yes, we did visit the Charleston Tea Plantation -- a lovely place -- will be my post tomorrow! Thanks for taking us with you. I'd love to take another carriage ride through old Charleston - I loved it so much the first time. On my - just beautiful here! Oh, my. . .thank you for taking me along with you and Sarah on your tour! Just what I needed on a work day here on the prairie! Just a short break for a "spot of tea" and then back to work. I'd love to join your class. Checked my schedule and I have to work. Let me know when another comes along! Lovely post! and her tea cups are really lovely. Thank you so much for sharing about your tea trip with us. I really enjoyed sharing your trip too Charleston. It truly is a lovely city. I have visited and went for tea there as well. what a lovely post! very enjoyable one to read and the wish I could join you too! :-) Marianne is such a lovely host too! 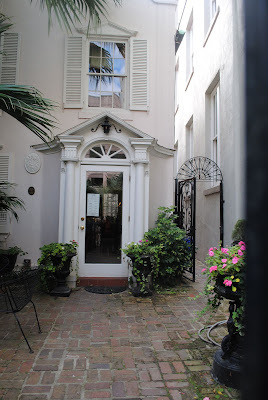 Someday I will have tea in Charleston. Thanks for taking me along in print. I feel like I was there with you. Charleston! It is in a class by itself. Of COURSE you went there. I can always count on you. You just "get it". I shared Charleston with my sister in June. She had not been there. We stayed downtown and enjoyed several days of all this town has to offer. Restores one's sense of what matters in life!